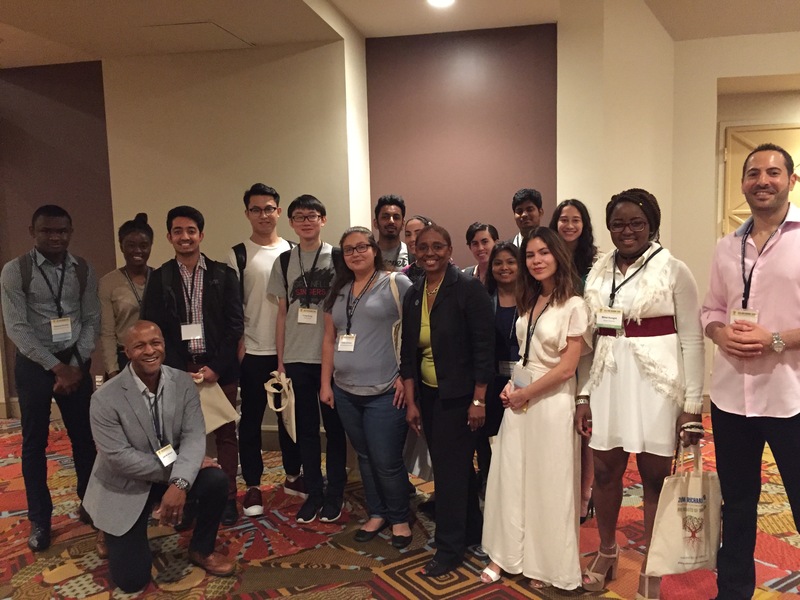 Participants of the 2018 ACM Richard Tapia Celebration of Diversity in Computing Conference. Speakers Valerie Taylor (CMD-IT CEO & President) and Joel Branch (Tapia Program Chair) join students for the Student Development Workshop. 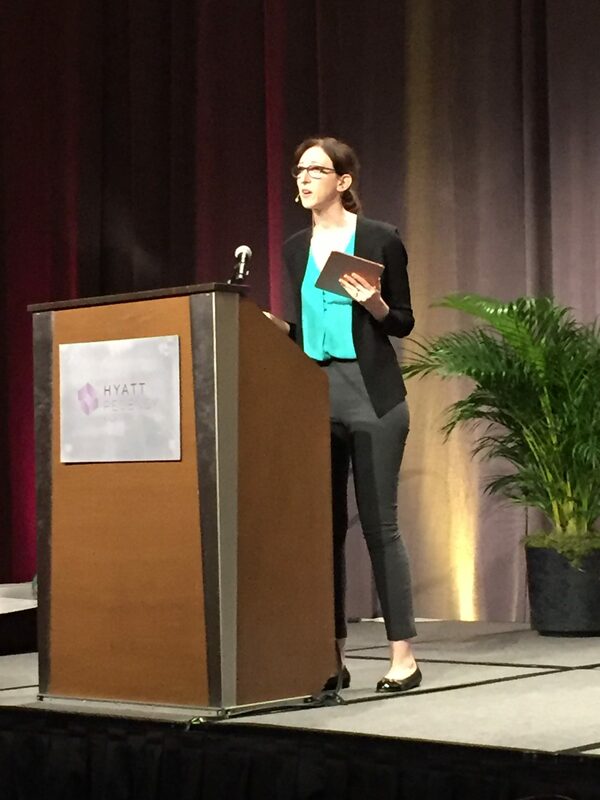 Be inspired by great presentations and conversations with leaders with common backgrounds. The 2018 Tapia conference theme was Diversity: Roots of Innovation. The theme reminds us to celebrate the historical role of diversity with respect to STEM innovation, and declare it as a standard, essential set of roots for computing innovation in the future. Conquering computing challenges going forward—while ensuring benefits across all global citizens—whether it is artificial intelligence, blockchain, cybersecurity, or a range of other subjects, requires the resources, talent, and experiences from a diverse collective. Just as we have embraced risk-taking, perseverance, and creativity as cornerstones of innovation, organizations and society must treat diversity with the same reverence. This should be reflected in our leadership, strategies, and policies. The 2018 Tapia conference broke attendance records with 1431 registered attendees, an increase of 20 percent over 2017. Of the attendees, 58 percent were students. Shiri Azenkot (Cornell University) during her plenary speech. “A Welcome Reception & Fireside Chat: Writing the Hitchhiker’s Guide to Autonomous Systems,” which included panelists Seraphin B. Calo, principal staff member, IBM Research; Ayanna Howard, Linda J. and Mark C. Smith Professor and Chair of the School of Interactive Computing, Georgia Tech; Jeff Ramos, general manager, The Microsoft Garage, and Hakim Weatherspoon, associate professor, Cornell University. Tapia 2018 also featured a career fair with more than 114 supporting organizations including leading academic institutions, technology companies, and government labs. Platinum supporters included AnitaB.org, Caltech, Carnegie Mellon University, Cornell Computing and Information Science, Georgia Tech College of Computing, IAAMCS (I AM CS), LinkedIn, Microsoft, MIT Lincoln Laboratory, Mozilla, North Carolina State University, Rice University, Stanford University, Two Sigma, UC Berkeley, and University of Michigan. Our platinum government participant was the National Science Foundation. Valerie Taylor (CMD-IT CEO & President) and Tao Xie (Tapia General Chair) present the CMD-IT University Award for Retention of Minorities and Students with Disabilities in Computer Science to the University of North Carolina Charlotte. Also pictured: Jennifer Chayes of Microsoft (center). 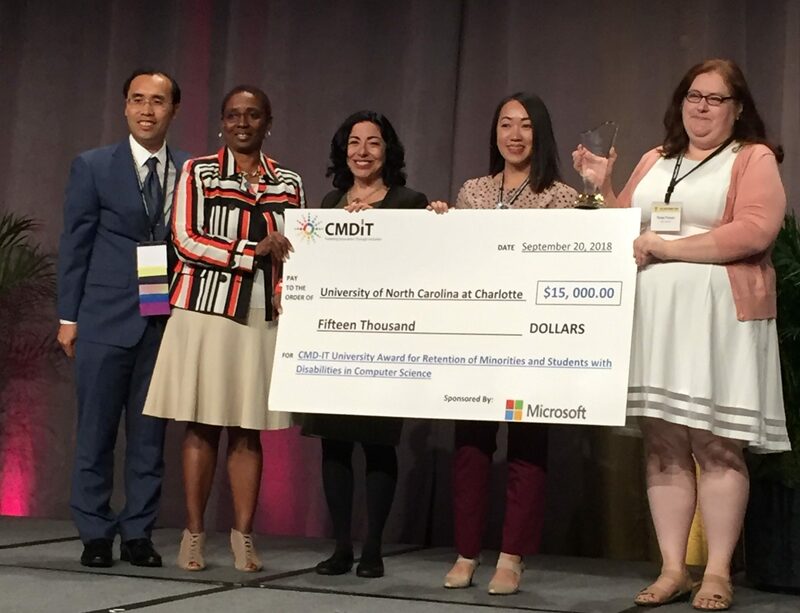 On Thursday September 20th, CMD-IT awarded the University of North Carolina Charlotte (UNC Charlotte) the second annual CMD-IT University Award for Retention of Minorities and Students with Disabilities in Computer Science. The CMD-IT University Award recognizes U.S. institutions that have demonstrated a commitment and shown results for the retention of students from underrepresented groups in undergraduate computer science programs over the last five years. The award, sponsored by Microsoft, is focused on the following underrepresented groups: African-Americans, Native Americans, Hispanics, and persons with disabilities. The award included a $15,000 cash prize. Implementation of the Connected Learner program. The program focuses on connecting students to peers, the profession, and the community. The Connected Learner program builds a sustainable practice of educational innovation across the undergraduate computing curriculum by increasing faculty awareness of teaching innovations, resources for pedagogical change, and support for teaching practices that engage students. Establishing multiple new scholarship programs that focus on promoting economic mobility and seek to diversify the student populations. Computing outreach to K-12 through the STARS program (Students in Technology, Academia, Research and Service). Since 2006, the College of Computing and Informatics (CCI) students have provided community outreach programs to 2,400 K-12 students. 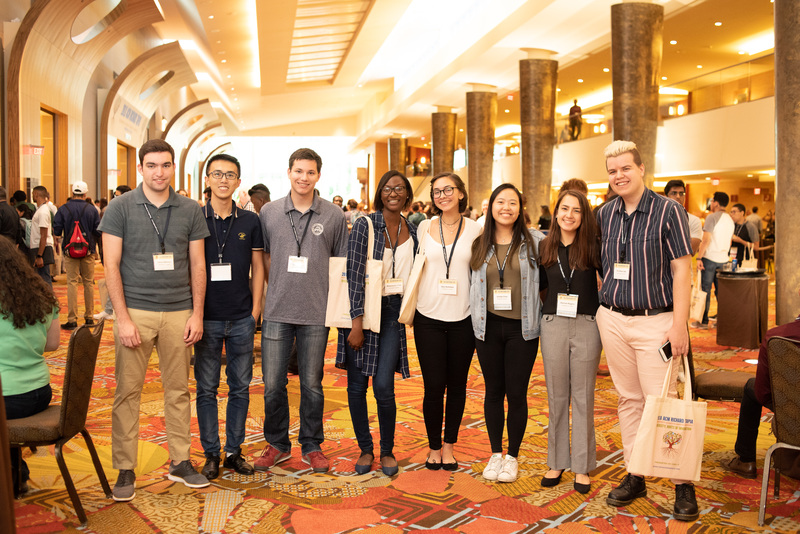 The CCI has been awarded a National Science Foundation CISE REU Site since 2006 in which their labs host 10-15 undergraduate researchers each summer. The program’s goal is to recruit, retain, and prepare a more diverse student population for graduate programs in computing. Creation of a task force by the CCI dean to measurably increase undergraduate diversity. Retention strategies include programs such as a peer tutoring, corporate mentoring, peer mentoring, and the acquisition of dedicated meeting spaces for women and underrepresented minority student organizations. Implementation of Improvisation Workshops to address bias and microaggressions in classroom and lab environments. “CMD-IT is pleased to award the University of North Caroline Charlotte with the CMD-IT University Award. Their commitment to the retention of underrepresented minorities and people with disabilities through the implementation of innovative and effective programs is having a measurable impact,” said Valerie Taylor, CMD-IT CEO and president. The University of North Carolina Charlotte presented details of their programs at the Friday, September 21st Faculty Workshop at Tapia 2018. Tapia 2018 closed with a gala featuring banquet speaker Shirley Malcom, head of education and human resources programs at AAAS. Malcom inspired the attendees with details about the new AAAS SEA Change program, whereby AAAS is working with colleges and universities to create institutional systems to improve the outcomes and opportunities for underrepresented groups in STEM. Malcom concluded by challenging attendees to continue to engage with the communities established at Tapia. Ayanna Howard (Georgia Tech) receives the Richard A. Tapia Achievement Award for Scientific Scholarship, Civic Science and Diversifying Computing from Valerie Taylor (CMD-IT CEO & President) and Richard Tapia (Rice University). During the banquet, awards were bestowed on the winners of the Tapia poster competition and the ACM Student Research Competition. 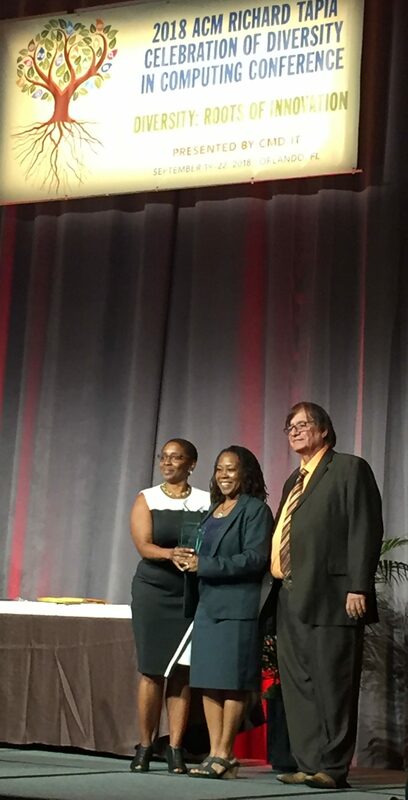 In addition, the Richard A. Tapia Achievement Award for Scientific Scholarship, Civic Science and Diversifying Computing was presented to Ayanna Howard, the Linda J. and Mark C. Smith Professor and chair of the School of Interactive Computing at the Georgia Institute of Technology. 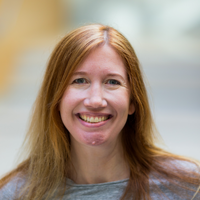 The Richard A. Tapia Award is awarded annually to an individual who demonstrates significant research leadership and strong commitment and contributions to diversifying computing. The conference concluded with the announcement of the Tapia 2019 conference, which will be held September 18-21, 2019 in San Diego, California.